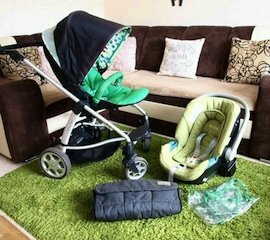 A black and green polka dot patterned baby stroller and attachable car seat. 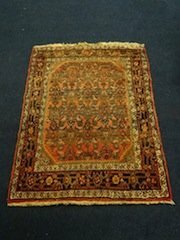 A vintage Persian traditional handmade woollen area rug, decorated with a brown and creme pattern against an orange ground. 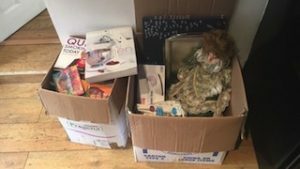 A collection of household items, to include a notice board, a brand new iron, a porcelain doll, oven trays etc. 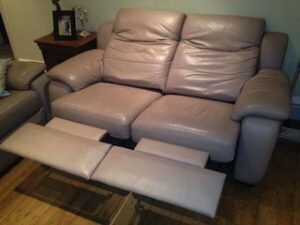 A three seater high back reclining sofa, together with a matching two seater sofa, upholstered in mauve faux leather. 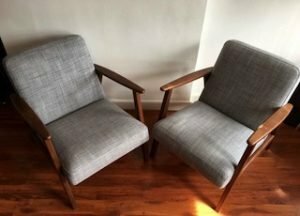 A pair of solid wood high back vintage armchairs, upholstered in grey cotton fabric. 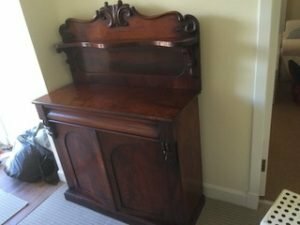 A tall standing heavily carved mahogany hall dresser, having one small shelf above a double cupboard. 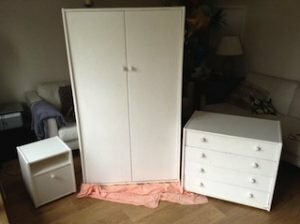 A three piece hand painted white bedroom furniture suite, to include a double wardrobe, a large chest of drawers and a bedside cabinet. 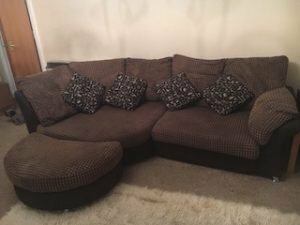 A large two seater irregular shaped sofa and matching half moon storage footstool, upholstered in chocolate brown velour and suede. 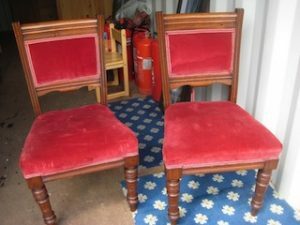 A pair of period style solid oak high back dining chairs, upholstered to the seats and backrests in red velour. 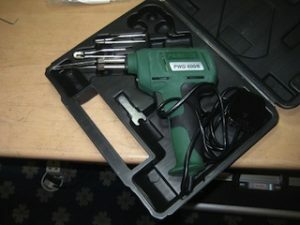 A brand new boxed green and black Parkside PWG 600/6 instant soldering gun. 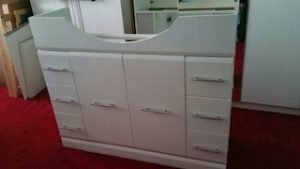 A large white solid wood under sink bathroom unit, having three drawer to either side of a central double cupboard. 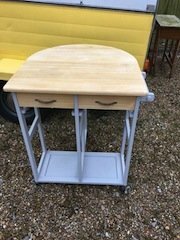 A solid pine and grey painted metal half moon butchers block on castors, having two drawers below the counter top. 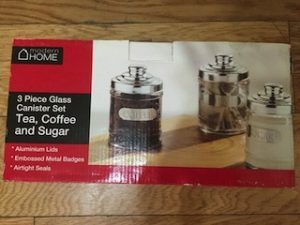 A brand new boxed Modern home glass and aluminium, tea, coffee and sugar canister set. 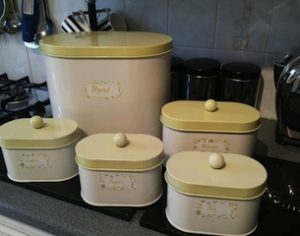 A set of yellow and cream oval vintage style kitchen canisters, to include a large bread bin, a biscuit tin and tea, coffee and sugar canisters. 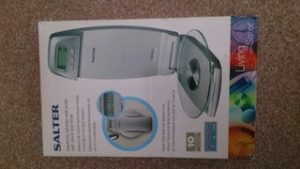 A brand new boxed Salter silver stainless steel and glass wall mountable kitchen scales. 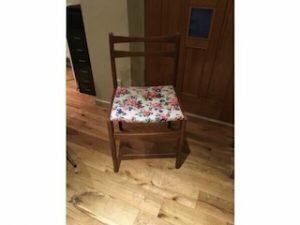 A small vintage solid wood bedroom chair, upholstered to the seat in floral patterned fabric. 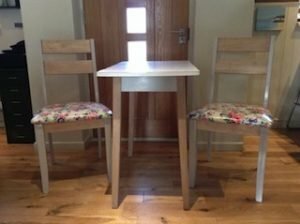 A solid wood tall standing retro breakfast table, together with two matching high back dining chairs, upholstered to the seats in floral patterned vinyl. 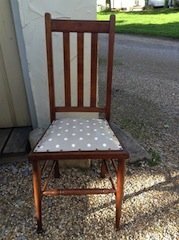 A vintage solid oak high back bedroom chair, upholstered to the seat in polka dot grey and white vinyl. 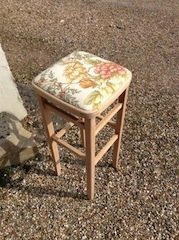 A tall solid pine vintage breakfast bar stool, upholstered to the seat in floral patterned fabric. 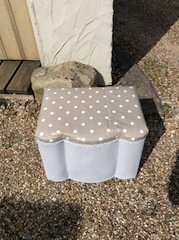 A vintage hand painted white Lloyd Loom blanket box, upholstered to the lid in grey and white polka dot vinyl.